Just when Cammie thought she was done with making cards for the graduation season, she was called upon to make a couple more cards for a special graduation. I think this card is a true wowzer because it looks great and is super simple to make. The hardest part is making the super cute tassle. 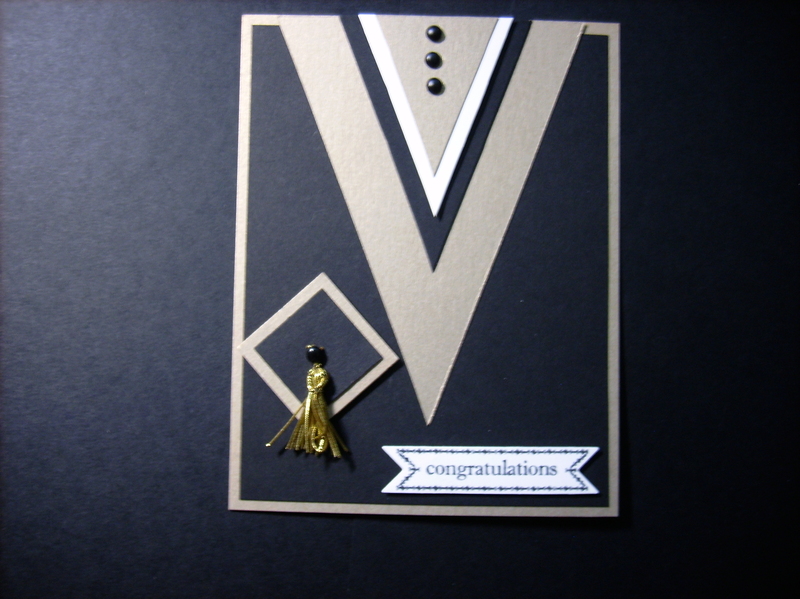 All you need is cardstock, the Bigshot and the Stampin Up Perfect Pennants Bigz L die #123126 to create the realistic gown. Imagine using the school colors of the graduate to personalize it even more. I am definately going to bookmark this card for next years grads. Cammie and I both get excited when we get happy mail in our mailboxes. 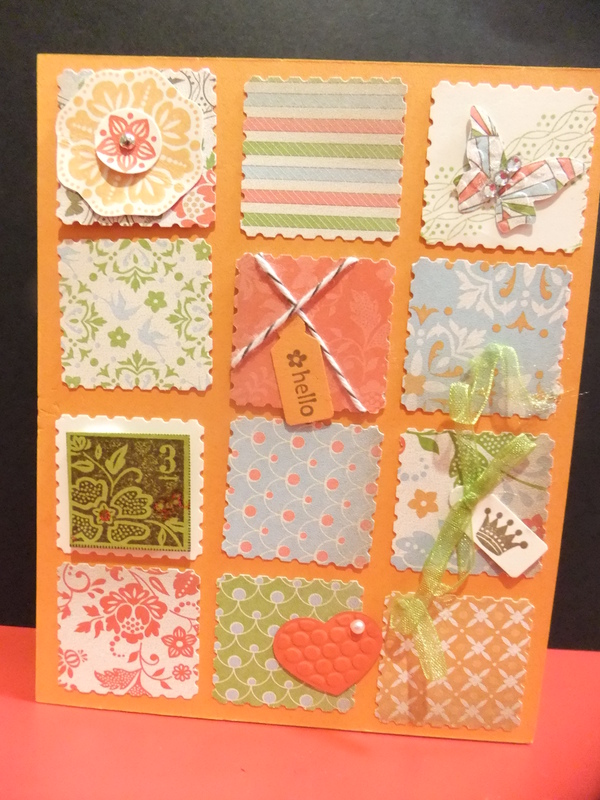 It is truly happy when the happy mail involves money and uses all Stampin Up products! Today’s post is just that and was from our dear friend and customer, Sheri Foos. 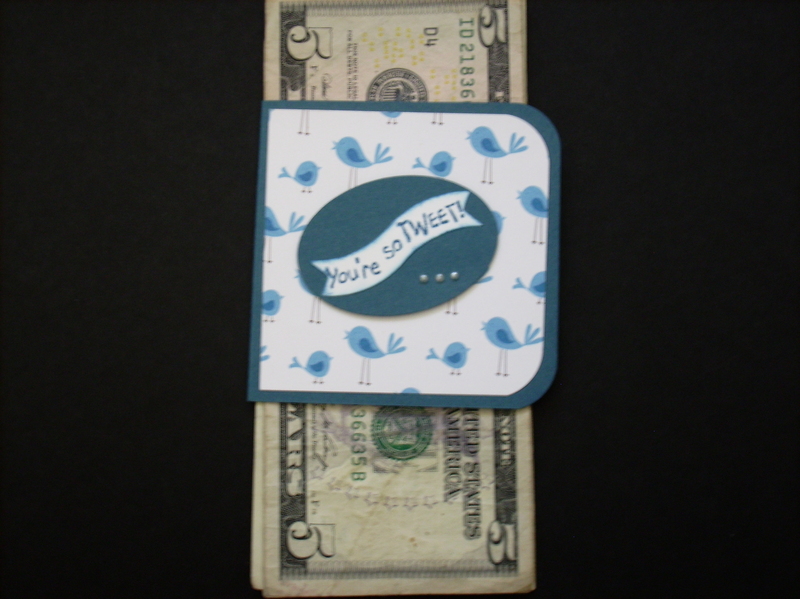 Sheri sent this cute money clip to Cammie for her July order. OMG it is so simple and cute and very adaptable to other holidays and events where money is exchanged. Great job Sheri! Today’s card is a protoype that Cammie sent me for her “Raining Flowers” workshop. We both received the Raining Flowers stamp set #122767 at the 2011 Stampin Up convention. A year has almost passed us by and neither of us have used the set and heck mine was not mounted until last week! 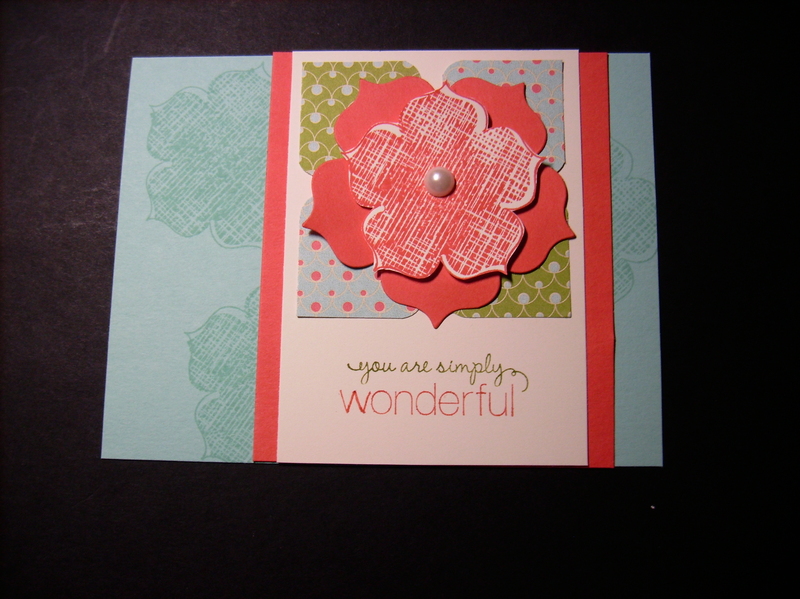 Cammie created this card and many more fabulous ones to come using the raining flowers stamp set. Cammie is famous for creating something wonderful out of ordinary objects and today’s post is no exception to that. 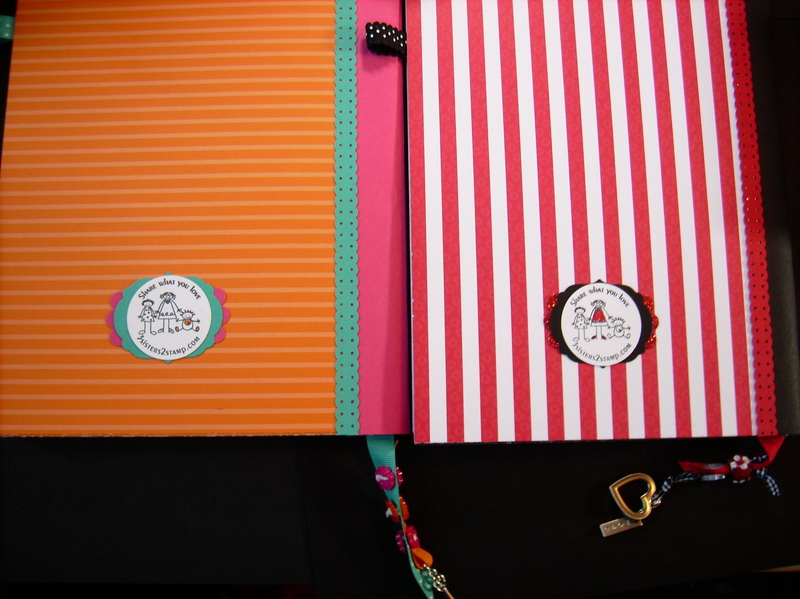 She took an ordinary composition book and dressed it up using DSO from StampinUp to create our Bright Ideas journals complete with ribbon and charm bookmarks. The light bulb was created using various Stampin Up punches. 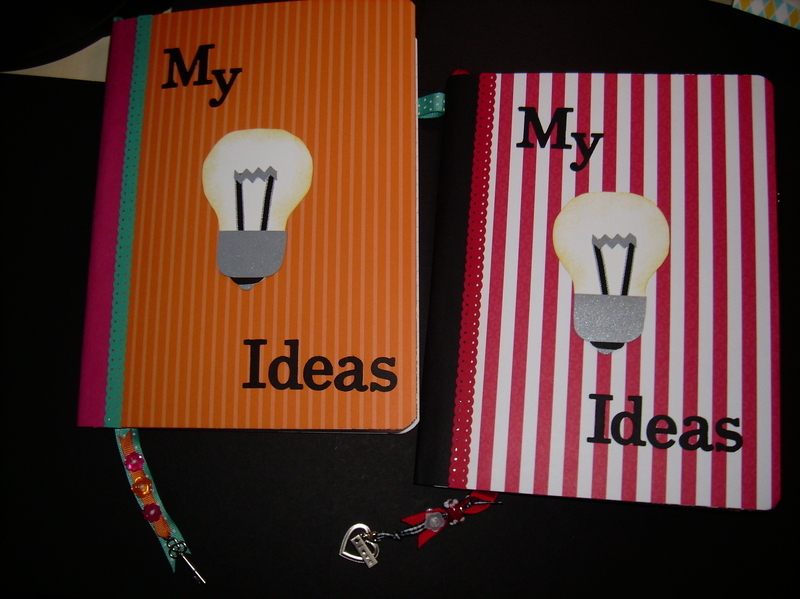 I absolutley love my journal. The Stampin Up fabric is a must have for any crafter. I don’t sew and I covet the fabric and am afraid to cut into it. Cammie on the other hand is not afraid to use it and she recently challenged me to get out of my comfort zone and use the fabric. So I pulled out my flirtacious fabric #122335 because I had backup…. 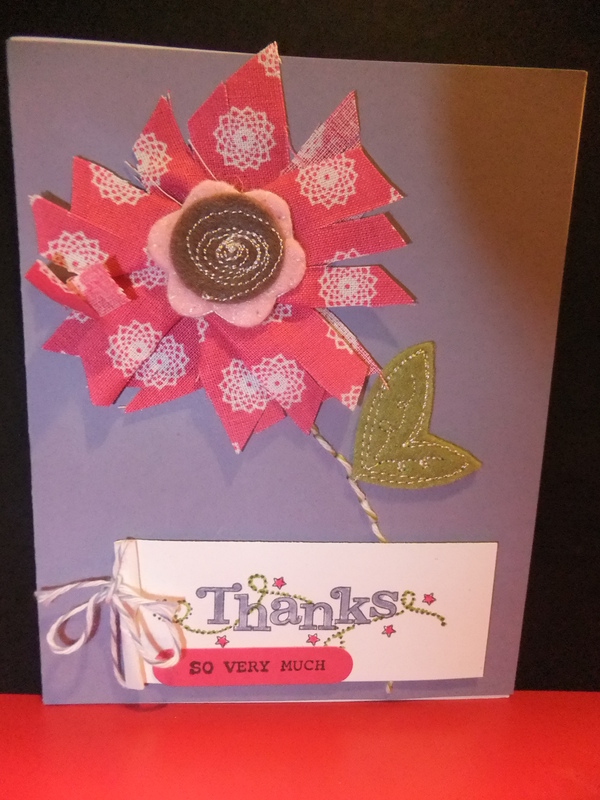 just in case I messed up and I used fabric on a card to created a flower and even stitched the stem using the lucky limeade bakers twine #125572. I liked how it turned out so much that I used this card in my card cafe!